At 9:30 am today, all of India tuned in to watch a small strip of land at Sriharikota in Andhra Pradesh. ISRO was sending a 104 simultaneous satellites into space, a feat that had never been attempted before – the previous best was 37 satellites that were sent by Russia in 2014. Anticipation was high, the launch was broadcast on all television channels, and streamed live on Facebook and Youtube. 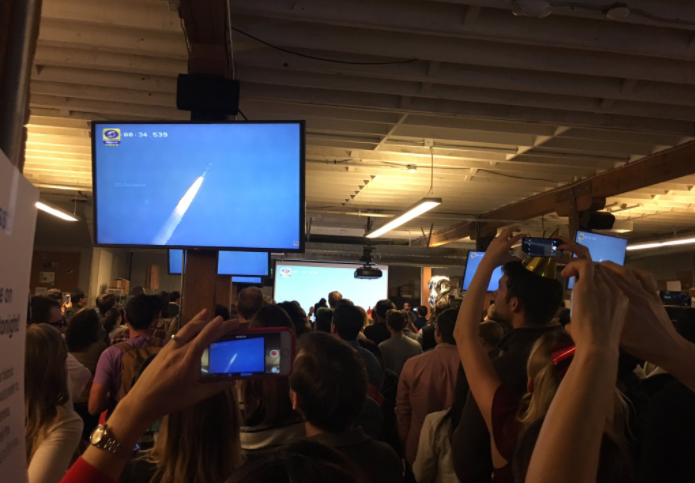 But thousands of miles away, 250 employees at a San Francisco startup were also watching keenly. They had a right to be nervous – the launch carried 88 satellites that belonged to their company, Planet Labs. Planet Labs was founded in 2010 by three NASA scientists, and has the mission of making “making global change visible, accessible, and actionable.” It achieves the visible part quite literally – it sends satellites into space, and they track and take pictures of our planet at regular intervals. Its satellites, called Doves, weigh around 4 kg each, and form a satellite constellation that provides a complete image of Earth at 3-5 m optical resolution and open data access. Like most startups, Planet Labs started small. “We started as a small team of physicists and engineers in a garage, using the cubesat form-factor to build our first Dove satellite,” the company says. Just two years after their first satellite, Planet now operates 143 satellites that orbit the earth, 88 of which were carried in the latest ISRO launch. This largest constellation of Earth-imaging satellites in history. After this launch, Planet expects to be able to image the entire Earth daily; right now it covers about a third of the world’s landmass every 24 hours. The uses for such data are many – Planet Labs provides its data for businesses, developers and researchers, and says it’s handy for geospatial services, mobile mapping, agriculture, and business intelligence. Planet Labs is in the enviable position of being a private company and being able to provide this service, and investors have reposed their faith in it. It has raised $158 million (Rs. 1000 crore) so far from big names such as First Round Capital and Yuri Milner. And this company choosing ISRO to launch its satellites is a testament to the Indian space agency’s reliability and cost effectiveness. There are several companies like SpaceX’s Falcon 9, Russia’s Proton ULA, and Arianespace are in the satellite-launching business, but Planet Labs appears to have become a loyal ISRO customer – before this latest launch, it had sent 16 satellites through the Indian space agency in July 2016.